In honor of April, Stephl bought me a new flash. Or maybe it was for her upcoming wedding. I don’t care. 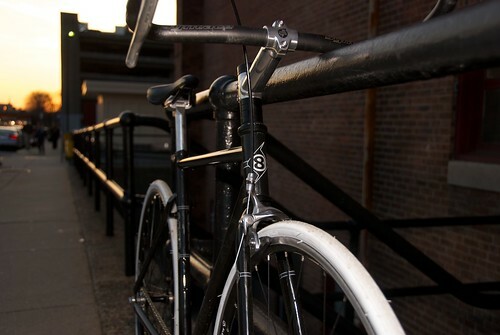 Because either way, I’ve got this kickass picture of this kickass bike, (just sold by Beardman Bicycles) and I am completely, totally, fully, in love with her camera. It’ll be SO hard to give it up come May. I’ve been thinking a lot lately about my favorite time of day. Like, where I’m most at ease. People have asked me that question before, and it’s left me totally stumped. I mean, frankly, I’m not a person who chills out a whole lot – I love to work, I love to be busy – so the answer isn’t all that easy to land on. But finally, yesterday morning, I figured it out. My favorite time of day comes just as I’m waking up. Bed is so warm, so comfortable, and for once I feel so incredibly relaxed. It’s great to lay there, to stretch, and then to roll over and try to sleep again. Unfortunately for me, my least favorite thing in the world is: waking up. Because, inevitably, just as I roll over and close my eyes for that second wondrous time, I’ll start making lists in my head. What to do, what I have to get done, how long I can conceivably stay in the snug cocoon of my bedsheets before reality intrudes once more. And then I can’t enjoy it. At all. And I wind up getting out of bed, which I hate, making coffee, which annoys me, and taking a shower, which I find incredibly tiresome. But there is that sweet moment before my brain turns on. That one moment, that bliss, that is my favorite time of day. I had a very productive April 1, and I think I like WordPress. This entry was posted on Friday, April 2nd, 2010 at 12:08 am and is filed under anecdotal. You can follow any responses to this entry through the RSS 2.0 feed. You can leave a response, or trackback from your own site. 2 Responses to Hello, World! Welcome to WordPress… I like it so far, too. I was glad to read someone else finds taking a shower tiresome sometimes! You always have a different perspective on life and I enjoy reading it! Keep on going girlene!